I’ve always thought that Beau Brummel has a lot to answer for. He’s the one who, in the early 19th century, set the standards that reduced the color palette in men’s clothes to brown, black, gray, and dark blue and – even worse – restricted men’s jewelry to rings, watches, cuff links and tie pins. No doubt his look was an improvement on Prinny’s excesses, but what Beau did was to condemn us to drabness. And if, like me, you don’t wear ties or French cuffs or carry a wrist watch because you look at it every twenty seconds if you do, your choices are even more limited. But, yesterday, I found a way around these restrictions that nobody can find fault with: I took home a three inch West Coast bracelet. I suppose I could have opted for the full Scottish effect for formal wear. Never mind that I don’t have the remotest connection to a tartan; kilts suit short-legged, barrel-torsoed men like me, and, like my late friend Paul Edwin Zimmer, I could have used an unclaimed one like Ancient MacAlpin. And Scottish regalia has the advantage of allowing you to wear more jewelry, although too much of it has banal thistle designs and you have to be careful that nobody that nobody calls your skean dhu a concealed weapon. But kilts are even more trouble than suits, and fabulously expensive as well. I suppose, too, that I could have got a tattoo. But tattoos are too permanent for my liking, and good ones surprisingly rare. And why go through discomfort for the sake of mediocrity? 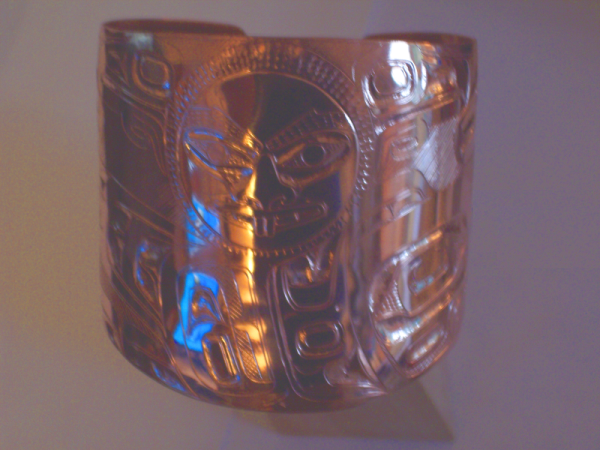 Instead, for almost twenty years, I’ve wanted a thick West Coast copper bracelet. At least in British Columbia, such bracelets are works of art, thanks to the fame of artists like Bill Reid, and nobody is going to make tiresome remarks about effeteness if you’re lucky enough to have one to wear (not that I would care if they did; my identity as a straight male is well-established, thanks very much). Not only First Nations men, but men of every ethnicity can wear West Coast bracelets and nobody thinks twice about it – everyone’s too busy envying them. But most West Coast bracelets you see are in silver or gold, metals that don’t catch my eye nearly as much as copper, even if they are more expensive. Besides, although I know that modern West Coast art is a blend of First Nations traditions and modern metal work techniques, copper seems more appropriate because the local cultures did work copper before their first contact with Europeans. Moreover, few bracelets in any metal are more than an inch and a half wide, and most are made for the tourist trade. What I wanted was an original work of art, on a surface whose size would do the design full justice, and a weight that I could never forget while it was on my wrist. And for years I couldn’t afford one, although I came close once or twice to placing an order. But in December, I suddenly had the the spare cash. I had long since narrowed down the shops to order from to two or three that were far above the watered down traditions in the Gastown tourist shops. Further investigation showed that Coastal Peoples in Yaletown was the only shop among those known to me that would take custom orders, so I placed my order there. My choices were limited by a lack of artists who work in copper. However, I did have three or four possible artists – assuming any were available for a commission. After careful consideration, I decided I wanted Tsimshian artist Henry Green. Not only is Green a versatile artist who works in several media – his carved masks are especially fine – but all his work had a strong sense of line that the others lacked. The Coastal People staff were polite, but non-committal about whether Green would accept the commission. However, a few days later, one emailed to tell me that he could do the piece in about a month. I rushed to put a deposit down before his schedule filled. Then came the design decision. Not wanting to be too exacting for fear of receiving uninspired or merely competent work, I diffidently suggested that the design include Raven and Mouse Woman. Raven, of course, is the trickster, while the lesser-known Mouse Woman is the keeper of tradition and domestic values, so I thought the combination an interesting contrast. So, apparently, did Green, since he told Coastal Peoples that he liked the idea. We did bandy about the idea of receiving a sketch from Green of the design, so that I could approve it. However, when I learned that it would be only a sketch and not a finished design, I decided it was not worth the additional sum he would charge. I abandoned the idea and settled down to wait. A month passed, and I heard nothing. I didn’t want to get impatient. Art doesn’t work well to timetables, and, besides, the holiday season had intervened, yet I was nearly shaking in anticipation. Then, yesterday afternoon, I received a call that the bracelet was ready. I soon abandoned the pretense of working, and knocked off early to pick it up; one of the advantages of being freelance is that you rarely have to work to schedule. The work was – overwhelming, in a word. Green had created not only an inspired work of art, but, between the size, metal, and design, a unique one. It was also a well-engineered one, since Green had chosen the gauge of the copper to be thick enough for strength, yet thin enough to be pliable and relatively light. Even the staff at Coastal Peoples seemed impressed. I told the clerk to tell him that I was extremely satisfied, and left wearing it. Someday, I might get a matching bracelet for my other wrist, and cement my reputation for eccentricity. Meanwhile, I keep looking at the design of Mouse Woman in the center and raven below her, and marveling at the bit of metallic beauty that has come into my life. Can you help me identify a copper artist ?? ?I have a fraed picture of a horse measuring 17×11. The signature is Henry W. Longfellow. That is the best I can make out of it. I know that this has been in my family for more than 50 years…. Your picture doesn’t sound like Northwest Coast Art, so I’m unlikely to know anything about it. However, if you search for “Henry W. Longfellow” and “copper,” you’ll find some information.